The Friedrich c 90a air purifier was discontinued several years ago. It has been replaced with the updated c 90b. The original is included here for comparative purposes. You may find this model either used or remanufactured. The Friedrich c 90a air purifier is an electrostatic precipitator. It does not use a media filter that will need replacing. Instead it uses collector plates. The filter is a permanent filter combined with a washable pre-filter and replaceable carbon filter. This will help to keep the operating cost down but requires more time cleaning filters. As an electrostatic purifier, the Friedrich c 90a air purifier does a good job removing particles from the air. According to Friedrich, this air cleaner is capable of removing particles down to 0.01 micron in diameter. Compare this to a HEPA filter that removes particles as small as 0.3 microns. The particles removed will be allergens like dust, dander, and pollen. This is good news for anyone with allergies or asthma. They will be able to find some relief by using this purifier. It is also capable of removing smoke. We find that it does not do as good of a job getting rid of gasses, chemicals, and odors. A carbon filter is included to remove odors. Honestly, there is not enough carbon there to do much good. The first week or two with a new filter, you will notice it removes odors. We think it will quickly stop removing odors. The same goes for chemicals and gasses. There is just not enough carbon to do the job. 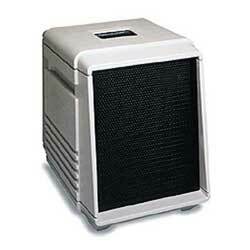 The Friedrich c 90a air purifier is an electrostatic air cleaner. This machine uses three filters. The electronic cell is a permanent filter. That's right. This machine uses a permanent filter. You will never have to buy a replacement for the main filter. The electronic cell does need to be cleaned. The easiest way to clean the cell is in the dishwasher. The cell measures 16 inches by 12.5 inches by 4.5 inches. Make sure it will fit before you try to use the dishwasher. Be careful not to bend the plates or break the ionizing wires. Complete instructions are in the owners manual. If you cannot use a dishwasher, the cell can be cleaned by hand. It takes more work to do it this way. See the owners manual for complete instructions. You may have to buy a replacement pre-filter. It is washable and should last a long time. You might need to replace it eventually, but you don't have to replace it regularly. The activated carbon filter will have to be replaced. It will last 3 - 6 months. You should replace it when it stops removing odors. If you don't care about odor removal, you will have to replace it less often. Be aware that the Friedrich c 90a air purifier will not work unless the carbon filter is installed. So even if it is not removing odors it still has to be in the machine. The Friedrich c 90a air purifier cleans the air in four stages. Stage 1: A pre-filter catches larger particles in the air. Stage 2: Air passes over ionizing wires that charge the particles in the air. Stage 3: The charged air passes through metal collector plates. Particles stick to the plates removing them from the air. 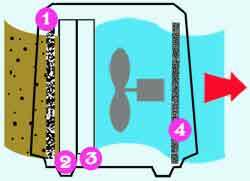 Stage 4: The cleaned air passes through an activated carbon filter to remove odors. The main advantage of this kind of air filter is there is nothing to replace. A HEPA filter must be replaced every 6 to 12 months. The cost of these filters can quickly add up. The Friedrich doesn't need costly replacement filters. This will save you money over the years. The disadvantage of this kind of filter is it requires frequent cleaning. A layer of dust and other stuff quickly builds up on the collector plates. As this layer gets thicker, the efficiency of the purifier decreases. 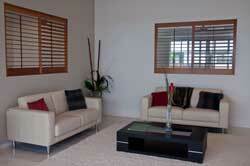 In order to keep your air purifier actually cleaning the air, you will have to clean it at least weekly. This is the trade-off you make by using collector plates. You don't have to buy costly replacement filters, but you will have to spend at least an hour a week cleaning the filters. YOU have to decide which you would rather do. Clean the filter once a week and save money or buy replacement filters and not save money. In our experience, most people do not make the commitment to clean the filter once a week. This quickly leads to running an air cleaner that is not really doing any good. Take home lesson: If you don't think you will be able to spend one hour a week every week cleaning the filter, don't get an electrostatic air purifier. The first cost to consider is the price of the Friedrich c 90a air purifier. Since this unit is discontinued, you will probably not find it in most stores. If you do find this model, it will be either used or remanufactured. There is no telling what price you will pay for it. There are two filters that will need replacing. The pre-filter and the carbon filter. The pre-filter will need to be replaced infrequently. It is about $33. The activated carbon filter will need to be replaced at least twice a year. It is about $25. We also need to consider the cost of electricity to run this air purifier. In order to make this calculation, we used a few assumptions. We use the lowest fan speed. We recommend that your air purifier is set on the lowest fan speed most of the time. When the pollen count is high or the air is dirtier than usual, you will use a higher speed. Be aware that using you air cleaner on high for long periods of time will cost more money. We assume it runs 24 hours a day, 7 days a week. We recommend that your air purifier is always on. This ensures that you always have clean air in your house. Not using it all the time will, of course, lower your energy bill. We use a unit price of $0.1093 per Kilowatt hour. This is from the Department of Energy average for the entire USA. The actual price of electricity varies from $0.05 to $0.15 per kilowatt hour. You can check your electric bill to find out how much you actually pay. The Friedrich c 90a air purifier uses 40 watts of power on its lowest setting. We use our calculations found on our air purifier cost page. We can add 10% to this to account for the times we will use a higher fan speed. So let's call it $42 a year. That means your electric bill will increase by not quite $4 a month. We always want to consider the size of the machine. The Freidrich c 90a air purifier is not the smallest. It is 19 inches high, 15 inches wide, and 21.5 inches deep. This is a reasonable size machine. Not too big and not too small. It weighs in at 28 pounds. While it is not intended to be moved around your house, it is easy to do so. This machine is rated by the manufacturer to clean a room 480 square feet. Let's find out if this is a reasonable room size. Remember, we need to get 6 air exchanges each hour. So we get almost 6 air exchanges an hour. This is an acceptable number. However, this is at high speed. We are not running our machine on high speed all the time. You will be using low speed most of the time. Let's redo our calculations using low speed. Here we get less than 6 air exchanges. So how big should our room be to get 6 air exchanges on low speed? Solving for area we get 281 square feet. 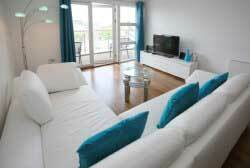 This tells us that to get 6 air exchanges an hour we have to have a room 281 square feet. This is not the quietest air purifier. It is quieter than most. It also moves a remarkable amount to air on low. Most air purifiers that are quiet are for a reason: On low they don't move much air. Not so with this one. It still moves a lot of air. These are the noise levels for the Friedrich c 90a air purifier. As you can see in the table, on low speed this purifier moves a lot of air and is still very quiet. It sounds about as loud as a computer. Is it quiet enough for a bedroom? That depends on you. If you can sleep with a computer on then this will be okay in your bedroom. If not then leave this in the living room. The Friedrich c 90a air purifier has received very high CADR ratings. These are among the highest of any air purifier tested by AHAM. You can read more about the goods and bads of CADR ratings. The Friedrich c 90a air purifier comes with a limited 1 year warranty. It will cover defects in labor and parts. However, since this model has been discontinued for several years, any unit you buy will be used or remanufactured. This means there will be no warranty on the air purifier. This unit produces ozone. It was tested by an independent company. The amount of ozone produced was 0.033 ppm. This is below the FDA recommended guidelines of 0.05 ppm. So although this machine, like all electrical appliances, produces ozone. The levels are low enough that it should not negatively impact anyone's health. The Friedrich c 90a air purifier has no special features. It is a very basic model with basic controls. Here is a summary of the Friedrich c 90a air purifier. Leave Friedrich c 90a Air Purifier Page and Return to All About Air Purifiers Home Page.